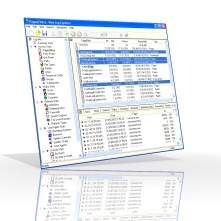 Web Log Explorer is the fastest and most powerful an interactive, desktop-based log analyzer for Windows. All log analyzers do almost the same. They take your log file, parse it and build reports by grouping or filtering the extracted data. Then you explore resulting tables or charts trying to figure out what is going on your web site, proxy server, firewall etc. The Web Log Explorer supports more than 43 log file formats. It was tested with all popular web servers, media services, proxy servers, firewalls etc. Needless to say, it can recognize log file formats automatically, extract compressed log files, process multiple log files and download logs from various sources: Local or Network path, Web, FTP or databases via ODBC. Web Log Explorer can even read most popular compressed log files: BZIP2, GZIP, ZIP, 7z, rar ans other so you won't need to unpack them manually.